The statement made by the Chief Justice of India calling for a justice delivery system that works round-the-year needs national debate. The CJI was addressing the legal fraternity in Jodhpur at the foundation-stone laying ceremony of a Bar Council of Rajasthan building, when he drew parallels between the justice delivery system and other requisite services like the medical & health facilities. 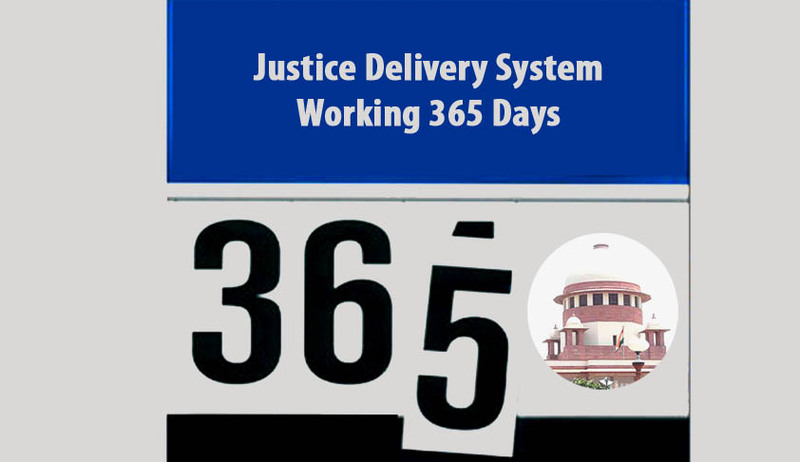 He envisages a speedy and free justice delivery system working 365 days a year, characteristics, most often than not, missing from the process of justice delivery in India. The CJI also touched upon the need to curb the number of adjournments during hearings. Often, these adjournments are deemed to be needlessly instituted roadblocks, preventing the expedient delivery of justice and would be allowed, from the subordinate courts to the Supreme Court, only if considered absolutely necessary. The statement of CJI hould necessarily be considered as being part of the judiciary’s perennial cry to the Government for an upgrade in the infrastructure of the judiciary, which seems to be inept to cater to an ever-increasing number of cases. Without sufficient facilities to deal with the disputes brought before them, the courts today have been left with an alarmingly increasing number of cases in the backlog. Recent estimates put the number of these cases at a whopping thirty million. But can the enormous backlog of cases or the painstakingly long judicial proceedings be attributed to the Judiciary alone? Or are there more actors to be held accountable on this count? One of the factors resulting in the under performance of the Indian Judiciary is the overwhelmingly unfavorable judge-to-people ratio in India.As of now, it is at an abysmally low rate of approximately 14 judges per million of the population. The 120th Law Commission report had outlined the urgent need of increasing the judge-to-people ratio to at least 50 per million people to mitigate these circumstances in 1985. In the thirty years that ensued, the ratio has only marginally improved, from 10.5 (as mentioned in the Report) to 14 judges per million in 2014. Further, while delivering the judgment in the case of All India Judges Association v Union of Indiain 2001, the Supreme Court itself directed the States to increase institute measures to push the said ratio up to 50 judges per million. Not only were these recommendationsnot implemented, it is observed that a considerable number of positions of judges in various courts in the judicial hierarchy remains vacant. The records of the Department of Justice show that there are numerous positions of judges remaining vacant in High Courts and subordinate courts across the country. In a response to queries from the Committee on Empowerment of Women in 2013, the Department of Justice stated that out of the 18,000 positions of judges in the country, nearly 3,000 remain vacant. The department also informed that it was mooting a proposal to add another 15,000 positions in the next five years. However, it is observed that even such a massive addition would still see India’s judge-to-people ration below that of a developing country (35-40 per million). It is often observed that the Government brings in new legislations for better governance, without any assessment of the impact they will have upon the implementing agency, the judiciary. A study conducted by the court management system revealed that as many as 18 states in India are not even spending the 1% of the budget allocated to them for the judiciary, as required. When the states fail to, or rather, refuse to spend adequately on providing the required support in the form of proper infrastructure or adequate number of trained personnel by way of judges and staff, the judiciary can hardly be blamed from the enormous backlog of cases that has been built up. The nature of funding the working of judiciary is in need of much scrutiny. Under the Concurrent List from the Constitution, the states are mandated to maintain the High Courts and the Subordinate Courts constituting the justice delivery system in their territory.However, it is a fact that up to 50-60% of the cases in the Courts financedby the States arise with respect to central legislations.Hence, instead of the States alone bearing the ensuing financial burden of attending to such cases, it is advisable that the Centre should also be mandated to at least partly fund the working of the Courts. Such a recommendation was stated in the report given to the then Law Minister, H R Bhardwaj in 2008. Further, newly drafted legislations should be accompanied by a budgetary estimation and financial allocation in the Bill itself. The Judicial Impact Assessment report further recommended that a Financial Memorandum be submitted along with any new Bill instituted in the legislature, detailing the various recurring and non-recurring expenses that may result from the institution of such a Bill into an Act. This should additionally include any expenses incurred by the Subordinate Courts as well. If these are not charged on the Consolidated Fund of India, then the expenses are to be attributed to the budget of the Ministry concerned with the Bill. Provision of more funds and better infrastructure can only be a start. The Governments, both the State and Centre, should attempt to address the lack of personnel in the capacity of judges. A country with the size of India’s population cannot expected to institute a justice delivery system that performs expediently with the current judge-to-people ratio. More personnel need to be recruited in the capacity of judges and that too with utmost urgency. Unless the judiciary can be streamlined thus to cater to the ever-increasing demands of the population, the country can never claim to provide the access to justice to its people, as guaranteed by the provisions of the Constitution.